Co-operative living arrangements occur when three or more biologically unrelated people choose to live together and share a common residential structure. Typically, in these co-ops, several people occupy a single dwelling unit, such as a large house, with each person (or couple) having a private area, including a bedroom and, often, a bathroom. In addition, the common areas of the dwelling usually include a shared kitchen, dining room and living room plus, at times, recreation or outdoor spaces. The residents of the shared dwelling generally establish some agreements as to what contributions, in terms of time and money, are required from each person. Commonly, the total expenses of maintaining the dwelling, such as rent/mortgage payments, utilities, repairs, etc., are allocated on a per capita basis to each resident. At times, it may be agreed that some residents can provide labor, such as housecleaning or yard care services, in lieu of financial contributions. In addition to agreements dealing with the allocation of basic household expenses, co-op residents often develop arrangements regarding daily activities, such as food acquisition, meal preparation and clean-up. Frequently, residents will choose to eat at least some meals (e.g., dinners) together in the common dining room. Plans are usually agreed upon specifying duties for each member of the co-op. A common model is to have some sort of rotation in which each resident takes a regular turn in cooking meals for everyone. Co-operative living arrangements may be developed for many other aspects of life in the shared dwelling. Social/recreational activities, use of common areas, and admission of new residents are topics for which agreements among the co-op members are commonly made. Generally, there is some established process in which members meet, discuss issues/proposals, and reach some decision as to what the policy of the co-op should be. Since most co-op residential groups tend to be egalitarian in nature, the decision making process is often consensual, with a preference for obtaining agreement from everyone before implementation begins. Members of a co-op living unit tend to have shared values, often based on similar demographics (e.g., all may be university students, retirees, etc.,). As a result of common interests, living arrangements for the group are often easier to establish and maintain than would be the case if the residents were more diverse in terms of age, socioeconomic status, etc. Disagreements over arrangements inevitably occur, however, and most co-op living groups find it necessary to have some sort of conflict-resolution process available when agreement cannot be reached. For most people, co-op living entails some restrictions on personal freedoms in order to accommodate to the needs and rights of others. Playing loud music in the living room may not be a problem if one is living alone in one's own home but it could be a concern in a co-op residence if others want to have quiet time there. The primary way the wishes of the group get expressed is in the co-op living arrangements that are agreed upon. Members essentially contract to abide by these "house rules" for everyone's benefit. Agreed-upon arrangements are sometimes informal and based on tacit understanding by the members. Alternatively, arrangements may be codified more formally, into a kind of "policies and procedures" manual, with sign-off agreement required by all members. Most co-op living groups find it necessary to have at least some kind of documentation, such as schedules showing who is to do what, and when. Written statements of operational guidelines are also helpful to inform prospective new members of what is expected of them. Many city, state and local governments will have restrictions/requirements for changes in land use. Be sure to check with your local governing authorities to make sure you meet all necessary requirements in opening your home to rentals. Although the limitations on individual freedom of expression may be perceived as a downside, the trade-off for co-op living members is the enhanced social interaction and support that can be realized in the shared residence. The arrangements themselves create a social structure that often promotes cohesion and bonding among the co-op residents. Joining with housemates in shared meals, clean-up crews, party-planning, etc., can provide interactive opportunities not available to those living independently. Some co-operative living situations emerge more or less spontaneously. Others are carefully planned with a specific vision in mind. Co-op living units are often created by a core group of people who want to form a kind of voluntary or intentional family in a shared living environment. Start-up decisions must be made regarding how to allocate personal space, what activities to share, what form of tenancy or ownership to adopt, etc. Coping with restrictive local regulations or opposition from neighbors may be issues. A common challenge is to fill vacancies with new members who have prosocial values, interests and abilities which are compatible with the existing group. Co-operative living is a kind of alternative lifestyle. It represents an option different in significant ways from the traditional model of independent living in which single individuals or couples live alone, each in a fully self-contained dwelling unit. One of the primary motives prompting people to explore the co-op living alternative is the perceived loneliness, isolation and disconnection from others experienced in the nuclear family and by many who live alone, even in a coupled relationship. By creating a family of choice and sharing a residential unit with that intentional ohana, individuals and couples hope to develop a home base of support and social security. Although co-op living arrangements can exist at any size, those involving larger groups are often referred to as intentional communities. Co-op living arrangements are generally thought of as occurring within a single dwelling unit, shared by all. Other group-living alternatives, such as coliving, cohousing or ecovillages, typically involve multiple dwelling units with some shared structures also. Collective housing is another arrangement where members might live in one dwelling, but they pool certain resources such as groceries and utilities to simplify daily chores. A commune may be seen as a special type of co-op living arrangement in which there is often less personal space and more communal ownership of property. Co-op living arrangements need not be based on any specific ideology or purpose other than to share the social and economic benefits of living together with others who are supportive and compatible. A gaming house is a co-operative living arrangement between members of a video game team, frequently one that competes in professional or esports events. ↑ "What Is Cohousing?". Bothell, WA: The Cohousing Association of the United States. Retrieved August 4, 2010. Cohousing is a type of collaborative housing in which residents actively participate in the design and operation of their own neighborhoods. Cohousing residents are consciously committed to living as a community. The physical design encourages both social contact and individual space. ↑ Global Ecovillage Network. "What is an Ecovillage?". Moffat, CO: Global Ecovillage Network. Retrieved August 5, 2010. Ecovillages are urban or rural communities of people, who strive to integrate a supportive social environment with a low-impact way of life. To achieve this, they integrate various aspects of ecological design, permaculture, ecological building, green production, alternative energy, community building practices, and much more. ↑ Jacobs, Harrison (May 5, 2015). "Here's what life is like in the cramped 'gaming house' where 5 guys live together and earn amazing money by playing video games". Business Insider. Retrieved December 11, 2015. Christian, D. L. (2008) . Creating a Life Together: Practical Tools to Grow Ecovillages and Intentional Communities. Gabriola Island, BC: New Society Publishers. ISBN 0-86571-471-1. OCLC 634260627. Scott-Hanson, C.; Scott-Hanson, K. (2005). The Cohousing Handbook: Building a Place for Community (2nd ed.). Philadelphia, Pa: New Society. OCLC 57392728. Yeoman, Barry (February 7, 2006). "Rethinking the Commune". AARP: The Magazine. Washington, DC: AARP (March/April 2006). Retrieved August 2, 2010. Zablocki, B. D. (1980). Alienation and Charisma: A Study of Contemporary American Communes. New York: The Free Press. ISBN 0-02-935780-2. OCLC 469664018. Communities Directory (online). "Intentional Communities Directory - ecovillages communes cohousing:". Rutledge, MO: Fellowship for Intentional Community. Retrieved August 5, 2010. Also available in print: Communities Directory (print). "Intentional Communities Directory". Communities Directory. Rutledge, MO: Fellowship for Intentional Community. ISSN 1088-8349. OCLC 32605029. Retrieved April 1, 2016. Federation of Egalitarian Communities (FEC). "The Federation of Egalitarian Communities: A new way of living is not only possible, it is happening now!". Retrieved August 5, 2010. FIC Web Weavers. "Intentional Communities - ecovillages, communes, cohousing, coops". Rutledge, Missouri, USA: Fellowship for Intentional Community (FIC). Retrieved August 2, 2010. Intentional Community is an inclusive term for ecovillages, cohousing communities, residential land trusts, communes, student co-ops, urban housing cooperatives, intentional living, alternative communities, cooperative living, and other projects where people strive together with a common vision. 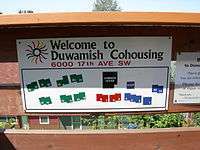 Duwamish Cohousing (formerly Ciel Cohousing), West Seattle, Seattle, Washington.